Jonathan Pritchard joins Anthony for this episode. Jonathan has been traveling the world and entertaining audiences as a Mentalist, even appearing on America’s Got Talent. He now offers consulting services as the communication skills he has perfected through his line of work are transferable and beneficial to businesses and individuals alike. We hear about Jonathan’s beginnings, his television appearances, explanations of mentalism with specific examples, and who Jonathan can help. The skills that Jonathan has honed. Being on America’s Got Talent. What mentalism is and how it works. Applying mentalism in different situations. 00:14 – Today’s guest: Jonathan Prichard. 00:58 – How Jonathan became a professional mind reader. His interest in magic at a young age. Evolution at each stage of schooling. Jonathan’s educational background in painting. 07:32 – Obtaining various talents. Obsession with learning how people think. 10:49 – Jonathan’s appearance on America’s Got Talent. The complexity of each episode. Being at the mercy of the show’s staff. Penn & Teller: Fool Us. People thinking TV appearances are the only thing that matters. 19:41 – How mentalism works. 23:48 – Applying mentalism to your own life. The show starts before the show starts. Using these skills in an interview. Showing how valuable you are by getting inside their head. 28:53 – Using these tactics during a one-time meeting. Being mindful of the impact of every single behavior. Thinking of people as long-lost friends. 30:47 – The substance of what Jonathan offers to his business clients. Building rapport with Jonathan’s audience during performances. 32:25 – Using these skills with significant others. Changing beliefs vs. changing behaviors. Coercion and manipulation are not what these skills are about. Keeping in mind everyone’s best interests. 36:54 – Who would benefit from reaching out to Jonathan. Living frugally your whole life does not guarantee you money in retirement — expand your income instead. Create a lifestyle that you don’t need to retire from. The sooner you start saving up for your retirement, the better yields you’ll have in the future. @the_pritchard – Jonathan’s Twitter account. [ ] Like a Mind Reader – Jonathan’s website. Think Like a Mind Reader – Jonathan’s book. ANTHONY: Today, we’re gonna talk about how to negotiate like a mind reader. So what if you could actually read somebody’s mind? How would that help you in your real life, in your career, in negotiations, in your relationships? To talk about all these things, I have a really interesting guest on today. His name is Jonathan Pritchard. Hey, Jonathan. Thanks for joining us. JONATHAN: Hey, hey, glad to be here, man. ANTHONY: So Jonathan, you are a professional mentalist for I think over 20 years. You’ve appeared on America’s Got Talent. Very cool. You’re the author of several books, including Think Like a Mind Reader, available on Amazon and on your website. And you’re also sort of transitioning, beginning to offer services where you have business coaching, speaking and training, I guess, in corporate settings. Does that kind of encapsulate where you’re at right now? JONATHAN: Yeah, that’s a great intro. It’s like well, I’m done here. I got everything I need out, so see ya later. ANTHONY: Nice. So I’m sure everyone listening, and I’m sure you’ve told this story hundreds of times. But do us that favor. Please, tell us all about how you became a professional mind reader. JONATHAN: This, basically, is a story that goes all the way back to my earliest childhood. So I’ll try to make it quick. But I grew being interested in magic tricks. I saw a magician on The Tonight Show. My parents let me stay up late and watch it. And from that moment forward, I went alright, I know what I’m doing with the rest of my life. And in junior high, I figured out that the mind reading tricks would freak people out. You can find somebody’s playing card. Okay, that’s neat. But when you tell them what street they grew up on, that’s deeply unsettling. It was like alright, that’s fun. Let me look deeper into this. And then in high school, I got interested in not only understanding how magic and mentalism works, but why it’s possible in the first place. Like, what’s wrong with our wiring in our minds that make it possible for people to lie to us and deceive ourselves? So I got interested in understanding how the mind works. And in college, I got connected with James Randi who is a kind of world-renowned skeptic and proponent of critical thinking. So he had a Million Dollar Challenge to anybody who claims to have genuine psychic powers. And if you could demonstrate it under test conditions with no ability to cheat, then you’d get a million dollars. So, four years in college every summer I spent down in Fort Lauderdale living at the Foundation handling applications for the Million Dollar Challenge and designing testing protocol for each applicant. That’s where I learned most of what I know about mentalism and why people believe weird stuff and how the mind works. And from there, that’s where I built my entertainment show. But it all rests on applied psychology and leveraging communication skills. And over the years, I started to realize more and more that the techniques I used onstage to entertain audiences are exactly the same techniques that are used in business, and relationship building, and life and self-help, all that jazz. So I understood and went wait a minute, I can demonstrate these principles in a way that most business speakers could only dream of. Most business speakers are talking about, “Here’s this anecdote that I made up “about a fictitious friend of mine “who was in this made up situation.” So, doing the interactive demonstrations where I actively involved the audience, it’s a collaborative experience instead of just a lecture. So, that’s how it all kind of got started. ANTHONY: I mean, that sounds like it would be an amazing experience for company teams trying to sharpen their skills in maybe their sales departments, or even just working with each other within the company. Let’s just roll it back a little bit to your childhood and entering college. I just have a ton of questions. I hope you’ll indulge me. ANTHONY: I’m a little bit of an amateur student in this area as well. I have taken classes in both NLP and Ericksonian Hypnotism. I don’t know if you feel that’s related. ANTHONY: What did you major in, for example? I’m guessing if it was related behavioral psychology or maybe even economics. Anything along those lines? JONATHAN: Not at all. But my educational background is in painting. My degree is in visual communication, right, fine art. Because when I was a kid, I knew I wanna be a performer. So to me, there’s the umbrella term of mystery entertainer. The flavor that most people are familiar with is magician. But a mentalist is even more specialized than a magician. So when I was a kid, I didn’t know about oh, I can be a professional mind reader for a living. That’s cool. So when I was a kid, I knew one: I wanna be a professional magician. And two: I was interested in G.I. Joe comic books. I loved G.I. Joe comic books and Transformers. Those comics were just awesome. The art in there is fantastic. So I went alright, that’s what I wanna do for a living. ANTHONY: I’m sorry, I just gotta jump in. Big shout out to Larry Hama. I love his story lines. But go on, please. JONATHAN: Dude, that’s awesome. I have a tattoo on my right forearm from the Arashikage Ninja Clan from G.I. Joe’s. ANTHONY: You have the three red stripes? ANTHONY: Spinning that back to your choice of college major, anyone who maybe thinking, oh well, that was a waste of time. He majored in art, or painting, but became a mystery performance specialist. That’s the wrong way of thinking. I mean, you are just building out various talents in various different ways that I’m sure somehow permeate your overall success. I mean, would you agree with that? JONATHAN: Absolutely. I went to college with the goal of learning and cultivating experiences that will give me a better ability to connect with strangers. I went to be a student of the world and to absorb as much as I could so that I could connect with more people. That’s what I went for. I didn’t go for the piece of paper that gets me access to this special gated job. That’s not why I went. I didn’t go to learn a trade or to get the certification required to be my own person. And the design skills. I’ve been building websites just because I love designing websites since high school. So I started hand coding HTML, and then switched over to the WordPress. So I’ve been building websites for other entertainers and myself. So I’ve done all of my own promo, video editing, poster design, postcards, business cards. Anything and everything that has and can have my face, I’ve put my face on it. ANTHONY: Looking at your materials, you definitely have a … It’s interesting to hear that you designed everything yourself. There’s definitely a designer’s touch to it for sure. JONATHAN: Thank you. So that’s kind of been my personal side hustle is doing design work for other speakers and entertainers in a variety of markets. So yeah, it’s just … I kind of did the math. Since 13, I was 13 years old. I’m now 35 years old. And I had a normal job for nine months. Like, that’s it. I had nine months of a design job before I was invited to pursue other opportunities. Because I wasn’t a good culture fit. I had good boundaries. It’s 8:30 and I’m starting work at nine. I’m already at the office, but I’m reading, because it’s still my time. People would come up and go, “Hey, can you take a look at the …” I will at nine a.m. So when I’m on the clock, my time is yours. But I’m not on the clock yet, so please don’t bother me. So I wasn’t a good culture fit. Like yeah, I’m glad I don’t fit that culture of poor boundaries in allowing people to pile too much on me. So, if you do the math, I’ve had something like 45,000 hours available for self-directed study. So if you do the oh, you need 10,000 hours to master a domain. Well, over those years, I’ve had time to master four domains. Whereas most people never have the time to master one. So design, communication, people skills, public speaking, this occupies my every waking moment. This is my life’s obsession is learning how people think, why they do what they do, and how to leverage that understanding to get impossible results for myself and the people I work with. ANTHONY: Let’s bring it to the, I guess, the most mainstream example we can talk about, which was your appearance on America’s Got Talent. Can you tell us what was it like being on that show and what you learned about it? Or what you learned from it, I guess? JONATHAN: It was fantastic. It was exhilarating. And it was brutal. When you watch a show, you’re seeing the final product of multiple thousands and thousands and thousands of man hours per hour that you’re watching the show. There’s so much that goes on to make that hourlong episode. So what happens is you spend weeks and weeks talking to the producers, scheduling your time to come in and audition for a different set of show producers. So then, you spend nine hours at the Chicago McCormick Place just getting led around by different production assistants saying, “You’re coming with me.” I’m like alright, I’m going with you. You don’t know anything. You don’t know anybody that you’re talking to. They just put you in a room with a whole bunch of other people where you just sit and stew. And then, an hour goes by and then somebody else comes and picks you up and goes, “Alright, we’re going to this room.” Like okay, I guess we’re goin’ to this room. So you’ve gotta be really comfortable with not knowing everything. So, only focus on what it is that you can control which is your own mind and the choices that you make. ANTHONY: So this must have been particularly difficult for your personality given how you just described to us your poor culture fit in a workplace setting, I mean, and your generally being a more self-directed guy. I mean, you must have really wanted this, I would imagine. JONATHAN: Right. You look at the situation, understand the dynamic, and then go this is something I’m willing to endure. Okay, this is what I have to do, so this is what I’m going to do. So you just kind of relax and just go alright, I’m gonna trust the process. These guys know everything they need to know. And all I need to know is how to do my trick. That’s it. So that’s all I’m gonna worry about. So then, you just can relax and enjoy the process. And when the downtime is there, you’re not sitting there freakin’ out and like, “Oh my god, I’m tryin’ out for national television.” You just go, “Oh this is a fun opportunity to do what I do.” So you go through that whole rigamarole. And then, they go, “Alright, we’ll be in touch.” And then, wow, they actually got in touch. “We’d love to bring you out to New York “to film in front of the judges, with a live audience.” Fantastic. So then they fly you out to New York. And then, it’s just like 10 hours of that. But, every time somebody comes to pick you up, you think oh, this is it. This is where I’m gonna go onstage and do my thing. So it’s emotionally exhausting because you never know when the hammer is going to drop. So I like to explain it as, imagine you’re sentenced to get your head cut off on this day. And every time somebody comes to take you somewhere, you’re going, “Well, this is it, this is where it happens.” And then they go, “Nope, we’re just gonna sit here “and talk for a while.” And you go, “Oh, okay.” You just get that adrenaline dump of oh, here we go. Here’s the big moment. Oh no, it’s not. Oh, here we go. No, okay. And then, after hours and hours and hours of that kind of dynamic, then you’re in the wings. Well, you’ve done the tech rehearsal. You’ve stood onstage. You talked to the stagehand. And you go here are my props. Here’s exactly how they need to be positioned. If they’re one centimeter out of spot, nothing works. And then, you have to trust this stranger who you’ve never met and will never see ever again to nail this thing after they’ve seen it for one minute. So your success is predicated on, hopefully this other person is really good at their job. Okay, so you are going to be onstage, in front of cameras, in front of celebrities, in front of 3,000 people live who might boo at you, who love booing. And then, at home you’ve got millions of people. But out of all of it, you’re always at the mercy of the editors, after the fact, who could cut in whatever reaction that they want. Right? So knowing all of that, would you be willing to stand onstage and put how you are perceived to millions of people at home in the hands of people you’ve never met, will never meet, and have absolutely no control over? But, everybody at home watching thinks it’s a documentary. This is an accurate representation of everything that happened. You’ve not seen any part of this. All you’re seeing is a sliver of the time and dedication and sacrifice of every single person that stands on that stage. And it’s a created experience based on the producers and the editors. ANTHONY: Yeah, it makes you realize that the winners, or, I guess, successful contestants on whatever type of show it is, may not necessarily be a product solely of talent, but a lot of other factors including luck and almost randomness, but also emotional endurance from what you’ve described. ANTHONY: Maybe even a big edge to folks who have done multiple shows before. So they kind of know what to expect. I mean, that might be actually a huge edge for a repeat reality contestant. I guess I would describe it as. JONATHAN: Yeah, ’cause I went through that. And a portion of my segment made it on, like several seconds. So technically, I’ve been on the show. But it wasn’t like I had a featured part and I made it through, and everybody cried at my tear jerking story. Because I don’t have one. So that’s why I wasn’t, right. So then, I went out for another show, Penn and Teller: Fool Us, which is a fantastic show that does a fantastic job of highlighting magicians and showcasing them in the best possible light. Everybody that’s involved with that show loves magic so much and they want every single person on there to succeed. There’s no chance of the audience booing you or the producers intentionally trying to trip you up or putting you in a bad light. So I love that show. And while I was doin’ that show, it’s exactly that moment where you go, oh yeah, I’ve been through worse. So if it’s your first time out, you’re gonna be freaked out and not have any clue. “Well, what’s goin’ on?” So once you kind of understand the process, you can just settle in and focus on getting the best result that you possibly can by controlling whatever it is that you can control which are your own choices. ANTHONY: Yeah, focus on making sure the stage manager and editors know and like you, so that they put you in the best possible light. ANTHONY: The experience in and of itself sounds tremendously valuable. And just congratulations on having those under your belt. JONATHAN: Thank you. And it’s this weird thing that people don’t think that you’re a person until you’ve been on television. They’ll watch a live performance, go, “Oh my goodness, I’ve never seen anything “like that in my life. “You’re incredible. “You should be on TV.” As though that’s the only mark of success that matters. So that this fake dynamic, those aren’t really people in the television. That’s light on a screen, man. There’s nothing real about television, nothing. People don’t believe in your skill, or your authority, or expertise unless you’ve been in this fake dynamic. ANTHONY: Which is fascinating given where we are in this state of online, how do I describe it, in the YouTube era, in the IGTV era. With so much self-publishing going on, TV still does hold the reins on that sort of authority, like you said. That’s interesting that it’s still there, right? JONATHAN: Yeah, people are still slaved to the idea that well we need gatekeepers. We need people who understand what’s good. And I’m going to let them tell me who to like. So that’s kind of what television does. It’s the stamp of approval that yes, this is socially acceptable and this is a person you should like. Oh, okay, thank you, producer for putting this person on television for me to care about. ANTHONY: Just to make sure I’m respectful of Jonathan’s time, I wanna make sure we have time to dive into the topics that are gonna be really really useful for our listeners such as how to use mind reader tactics, I guess, for your personalized job interviews, career and such. But before we do that, I do wanna make sure that folks realize that this is not out of reach. And that Jonathan is not Professor Xavier. There are actually techniques and skills that are learnable. And the way I’d like to ask that of you, Jonathan, is can you talk a little bit about how mentalism works at a very high level? And how does somebody quote unquote read somebody’s mind? How does somebody read body language, you know, to the extent you can talk about that in a very short podcast, that’ll at least let our listeners know this is doable on an everyday level? JONATHAN: For sure. It is a skill. It’s not a gift that you have to be imbued with upon birth from your witch grandmother. Nothing like that. It’s a skill and really all it boils down to is phenomenal communication skills. That’s it. And phenomenal communication is a function of information management: the right information at the right time. That’s all it is. So the way that mentalism works is the mentalist understands how to build a context through their words, their tempo, their body language, their physical actions, the place where the communication is happening. Is this online? Is it onstage? Is it on the sidewalk? Where is the communication happening? Everything around the message influences the meaning that is delivered to your audience. Whether it’s an audience of one, or 5,000, or five million, it doesn’t matter. So you create this context which allows meaning to come through. And that meaning creates natural assumptions. Like logical assumptions on the part of the person hearing it. And then, in a magical way, you then show those assumptions to be wrong, right. ANTHONY: I just wanna jump in with an example that our folks might be more, I guess, be able to wrap their heads around. So if a man says something to a woman over a candlelit dinner, that might have a totally different meaning and context than if they say it to them in the workplace. Just as an example. I mean, is that a good way of framing it. JONATHAN: Exactly. So the way I like to say this is from one of my mentors, Banachek. He always said, “Look, if I’m sitting on a park bench “next to my girlfriend, a beautiful woman runs by “and I watch her run off into the distance. “My girlfriend slaps me. “Not one person said anything, but you’d know exactly “what all three people were thinking.” Right? It’s all about context. In sales, what’s the context? How’s your website designed to funnel and encourage the behavior that you want? Are you giving too many options to the visitor so that then they get overwhelmed and they don’t take any action other than clicking out of your website? So do you make the best behavior for you, which is for them to learn more about your product or service or whatever, right? So make that the only thing that they can do. And then, using copy and imagery and video, make that behavior the most compelling and interesting behavior that they could possibly take. Right. Make that their fundamental drive to find out more. And then make it super easy for them to do that. So making your message too complicated works against you. So define what effect you want to have on your visitor, on your prospective client, the website visitor, your boss, whatever it is. Define what thing you want them to do. And then figure out the cleanest, simplest, most direct and effective way to help that behavior happen. And you do that through your words, actions, framing, timing. Everything that goes into what it means to be a communicator matters. ANTHONY: Let’s apply these to some … I’m sure everyone’s been waiting about how to apply these to sort of their own lives and their own examples. So let’s take a very common example where you’re meeting with your boss to discuss a promotion and/or raise. What are some ways to set the environment? To prime the conversation? What are some ways that you can recommend for that situation? JONATHAN: The show starts before the show starts. The show starts the instant somebody sees your first promotional poster, or advertisement. So that’s because the negotiation starts weeks before you sit down in the room with your boss. So if you think about the negotiation starting the moment you walk in the room, you’ve already lost. Because you haven’t done the preparation required to make sure that the negotiation will go the way that you want. Because if you’re starting when you walk in the room, you’ve gotta know that your boss has already been seeing this conversation coming down the line. And then they’ve been preparing for weeks. Right? So you’ve gotta set the stage before you ever step on it. So you’ve gotta start weeks ahead of time and go … Well, when you first get hired, let’s start there. Ask the person hiring you, so in six months, when we’ve been working together and just knocking it out of the park, what are the two or three things that you would see and go, I know this is a fantastic success and that this was a great idea? So what things need to happen for you to feel like this was a win for everybody? Then they give you the criteria of evaluating the quality of your work. Now you’ve got something to work with other than walking in the room and then going I want more money. Like, why should be give you more money? Well, because it’s been a year since you gave me more money. And now, it’s time to give me more money. Is that a compelling argument? Uh-uh. ANTHONY: And ideally, the person you asked when you were first hired is the same manager and you’re basically feeding their words back to them. Like you said … I mean, not in those words. That’s very aggressive. But in the past year, you mentioned that if X, Y, and Z occurred, that would be fantastic for you. And X, Y, Z has happened. So, what’s next buddy? JONATHAN: Exactly. So you’d know what to pay attention to every day at work. Every week, you’d keep track of how what you did created the outcome that they wanted. Now, you can show, empirically, how much value you’ve brought to the company. And once you show how valuable you are to the company, how much money you’ve brought in, how much money you’ve saved, now you’ve got a reason to go in and go, Look at the job that I’m doing and the value I’m bringing the company. And here’s what I’m getting paid now. And just 1% of what I’ve brought into the company would be this much of a raise. So let’s talk numbers. Now, you’re negotiating based on the criteria that they value. Of course, you’re gonna value more dollars, but the company values more productivity, more results, savings, right? So if you are only concerned with what you want, “I want more dollars.” Okay, we all want more dollars. “Get out of my office.” But you have to be a mind reader,. Get inside the head of the person you’re negotiating with. Understand inside and out their needs, their pressures, what they value. And then, you’ve got a basis for communicating why what you do gets them what they want. And that’s the only position of power. So, the question naturally becomes, right, well how do you figure that out? Well, you’re not actually psychic. Nobody is. But there’s a really good way of understanding how people think. That’s asking them questions. Right? That’s the only way you can do it. Have a conversation with your boss, with the lead, with the CEO of the company. Get engaged. Pay attention. Ask good questions. Involve yourself. So that’s the only way that you’re going to know what it is that they’re thinking. Now, what’s going to help them tell you the truth? Well, that’s where rapport and trust building comes in. You’re not gonna blab about the private conversation you had with everybody. So you’ve gotta be a trustworthy person that other people can communicate with and trust with their honesty. So if you can’t be trusted with secrets or their feelings or their goals, well then, you’re gonna get cut out. So the only way that people can trust you with the truth is to not punish the truth and show that you’re trustworthy. So that’s all rapport building and connection building. ANTHONY: Some of those last points regarding trust and rapport building seem like a little bit of a long game. So my question would be how do some of these tactics, or mindset shifts, apply to something where you’re meeting somebody only once, like a job interview? So you don’t have that runway to start asking questions over time and such. JONATHAN: I always like to think that no special tactic will ever make up for strategic failure. If you just totally don’t understand the dynamic of connecting with a human being, regardless of context, no specific little tip is going to make up for that. So even if it is a one-off interview for a job, you had to have had some contact with this person before. It’s not that you just showed up into this office and go hey, my name’s Jonathan and I wanna talk to the hiring manager. Right? So that alone would show hey I’m going to impose myself on your time and be disrespectful of your boundaries and proper sequence. So you just communicated before you ever said a word that you don’t really understand how things work. So be mindful of the impact that you’re having through every single behavior you engage in, whether it’s through email, or in person. But one of the best ways to build rapport with somebody and to help them feel comfortable connecting with you is think of them as a long lost friend that you just haven’t seen in a while. Assume that you’re going to be best friends, and that you love seeing this person, and you’re excited to reconnect with them. And you show up with that kind of warmth and openness and willingness to really be there and listen to them, then the behavior you emulate is going to be the behavior that they reflect to you. ANTHONY: This is really rock solid stuff. Is this really sort of the substance of what you offer to your business clients who seek you out for speaking engagements or team trainings? Is that kind of what you do? JONATHAN: Exactly. I basically help my clients, big and small, rewire how they think about communication skills. Because as a performer, and specifically as a mentalist, I’m a mind reader. I actively need an audience to do what it is that I do. So that means I have to invite perfect strangers who I’ve never met up onto stage, which is a really uncomfortable situation and dynamic, and I’ve got to communicate here’s exactly what I need you to do. So I’ve gotta have really clear instructions that the person can’t possibly mess up, so that I set them up to look the best they possibly can. Right? So that is rapport building. That’s trust establishment. Everything I do is dedicated to making the audience feel as comfortable in my care as humanly possible. And the more trust you can build with your audience, the more likely you are for them to listen to your message and be willing to hear more of it. And that translates directly into more dollars. So there’s the old dichotomy, “Alright, in business, is it better to be liked or trusted?” “Well, I think it’s better to be trusted because …” No, that’s a false dichotomy. You can do both, and they both feed into each other. They’re both a function of how trustworthy are you. ANTHONY: Let’s move it over to the personal realm. There’s different dynamics in the workplace setting. But I’m sure a lot of people have gotten into disagreements with their significant other or spouse over, I don’t know, where to have dinner or maybe even where to buy a home, where to move next, things like that. I don’t want to promote trying to research ways to get your way and only your way. But are there any recommendations you have for that kind of relationship? JONATHAN: Yes. First though, we gotta zoom out one level. Because you’re touching on resistance that a lot of people have to this kind of work which is it feels icky. I don’t know why, but this feels like Jedi mind control. And I don’t like it. It feels manipulative. So we’ve gotta break that down. Here’s the way I like to think about it. You can either try to change somebody’s beliefs or their behaviors. Right. So imagine a vertical axis. At the top are behaviors. At the bottom are beliefs. On the X axis, the horizontal axis, who does it benefit? Solely you? On the other end would be everybody involved. That’s the mythological win/win situation. Right? Benefiting you means it’s a win/lose. Benefiting everybody is a win/win. Now, if you try to change somebody’s behaviors so that you win at their loss, that’s coercion. I don’t care how you think. I don’t care how you feel. All I care about is what you’re doing. So, I’m gonna pull out a gun and say give me all your money. So I’m coercing you to give me your money. That benefits me at your expense. That’s not good. ANTHONY: What about a less, a more mundane example where a wife wants Italian for dinner and I want Vietnamese. And we both want what we want, but I really want Vietnamese. JONATHAN: “Listen, I make all the money in this relationship. “And we’re gonna go to the restaurant that I want. “Otherwise, we’re breakin’ up.” That’s coercion. But then, on the bottom side, you’re trying to affect their beliefs. That’s manipulation, which is usually withholding information that somebody needs to make a fully informed decision on whether or not to continue a relationship with you. So you purposefully withhold information that would reflect on you negatively, or information that would change their mind. So you manage the narrative, lie to somebody to manipulate their belief about how they feel or think about you. You cheated on your partner. And then you lied to them about it because you don’t want them to break up with you. So you’re manipulating them by allowing them to think something about you that’s not true: that you haven’t cheated on them. So that’s the difference between coercion and manipulation. But on the opposite side is alright, you’re trying to influence somebody’s choice. But you don’t really care about how they believe yet. And that restaurant example is perfect. Because you know that they’re going to love this restaurant. But they just don’t know it yet. But you know them well enough to go, “You know what, this is gonna be “a fantastic time for everybody. “This is the perfect situation for this. “All things considered, this restaurant is exactly “the right choice for the evening that we want to have.” So it behooves you to be as good a communicator as possible to influence everybody to then go choose to be at that restaurant. ‘Cause everybody wins in that dynamic. If you can change the way somebody believes, how they operate in the world, or how that you are, those belief structures, once shifted, lead to new behaviors. The behavior is influence. Persuasion is beliefs. So the more persuasive you are, the more effective you are on the behavior level too. So that’s the difference between influence, persuasion, coercion, and manipulation. So when most people have a negative reaction to being a better communicator, what they’re having a reaction to is I don’t want to be manipulative, and I don’t want to be coercive. So always filter your communications through do I have everybody’s best interests at heart here? Or am I trying to use my skills at their loss? ANTHONY: Jonathan, you’ve really covered my entire list of questions. Can you tell us a little bit about who would benefit from reaching out to you? And who you best serve with both your books as well as your consulting services? JONATHAN: If you’re interested in understanding why people do what they do and being a better communicator, that’s what the book is for. It’s the compilation of 20 years worth of traveling the world and being a professional figure outer of how people think. So, if you wanna get started on this stuff, get the book Think Like a Mind Reader. And after you’ve done that, if it still appeals to you and you go, “You know what, I wanna dive deeper “into how this applies in my own life. “I wanna be a better partner to my romantic life. “I wanna be more effective as an employee “or as an entrepreneur. “I wanna be a better leader.” All of these issues are human issues. I’m not gonna help you figure out how to click buttons better. But I’m gonna help you communicate on every level more effectively, which leads to a happier personal life, which leads to a more effective business life. So to me, the most powerful force in your life are your relationships. And the quality of your relationships are directly tied to the quality of your communication skills. Just because you talk a lot doesn’t mean you’re an effective communicator. So, I help companies best that have teams of salespeople, or research and development who need to be better communicators internally and externally. I can come in, do a two-day workshop on the core business skills of communication, or one-on-one coaching for entrepreneurs and people who just wanna take their life to the next level. ANTHONY: And I think a lot of our listeners fall into those categories. So I’ll make sure to … What’s the best way to reach you: email, Twitter? What do you prefer? 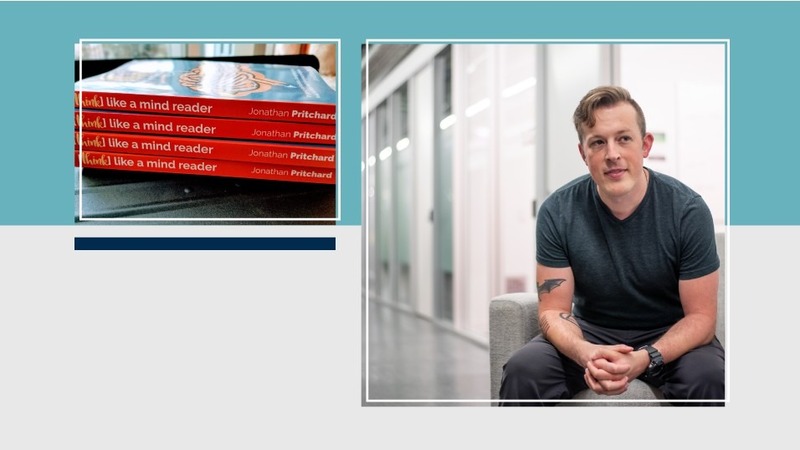 JONATHAN: The best way to reach me is email: jonathan@likeamindreader.com. I am super active on Twitter, which is the_pritchard. But if you wanna talk business, then email where I can search it and keep track of it and not let it fall through the cracks. That’s the best place to get plugged in. ANTHONY: Perfect. And we’ll include all that, including links to your website and your books in the show notes. Jonathan, thank you again. This was a fascinating and fun talk actually. It’s the episode where I nerded out the most. That was fun. JONATHAN: My pleasure and thank you so much for allowing me to share my message and connect with your audience. ANTHONY: Cool. Thanks, Jonathan. Everyone else, make sure to hit the subscribe button, or go to anthonyspark.com and join our email list so you can get regular updates. Talk to you later. Take care.